Last June 2009, I joined the trip of my college friends and their colleagues to Ilocos. My ticket is actually my other friend’s but unfortunately she wasn’t able to travel. And so I had to make a fake ID with her name on it. (It’s illegal I know but hey… sayang ang ticket no!) It’s an econolight ticket so that would mean no food, no headsets, no nothing plus I had to be seated at one of the back rows. We boarded the Philippine Airlines flight bound for Laoag around 930am. When I got inside the plane, I was welcomed by the head flight attendant who happens to be my former classmate in highschool. We were both surprised! We exchanged besos, kamustahan and all until we realized that there are other passengers at my back. Ooops. Sorry! Cause of delay eh. Haha. I was seated beside my new friend (my friend’s colleague) at the first row… at the first row after the non-econolight passengers. Haha! To add more fun, our backseats were pasted with econolight stickers too . Haha again! 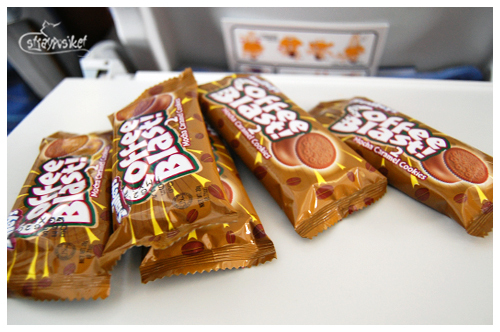 A few minutes after take-off, the FAs started serving the snacks. Sorry econolight passengers, no snacks for THEM and yes I mean THEM because I’ve got mine. *demonic laugh* I’m friends with the head FA remember? The head FA will remain unnamed for security reasons. These are my snacks. And they are 5x as much as the non-econolight passengers got. 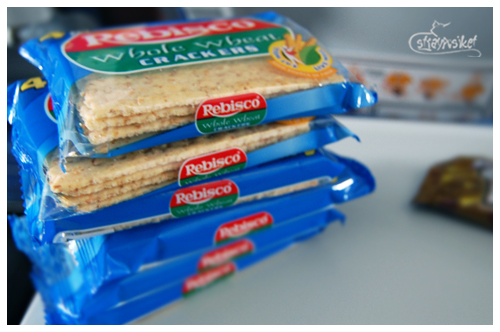 *demonic laugh again* Of course I shared them with my seatmate and my other companions.